The Patterson Elementary School Parent Teacher Organization is a 501(c)3 Non-Profit Organization that supports Charlotte Patterson Elementary School in Gilbert, Arizona. The PTO raises funds to not only purchase items needed by Patterson, but to also provide enrichment opportunities for students and allow for family fun events! With the hard work of our parent volunteers, we are able to make amazing things happen at Patterson! As a parent of a Patterson Elementary student or a teacher at Patterson, you are a member of the Patterson PTO! Let’s work together to build a running path that is safe for our students. Send a PRIDE-filled message and a treat, to your student, friend, teacher or a staff member with a PTO Candy Gram. The Candy Grams were delivered on Valentine’s Day, Thursday, February 14th. Orders and payment must be returned to school no later than Friday, February 8th. CEF Raffle benefits CUSD teachers and students! 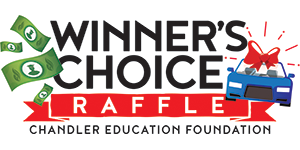 In just 10 days, we will pull the 2019 winning ticket for the Winner’s Choice Raffle and a lucky person will have the choice - $27,000 off the MSRP of a new Toyota, OR $20,000 in cash! Don’t worry though; no one has to decide on the spot! Online raffle sales will end on Friday, January 25th at noon. We have added an extra bonus for those who missed our early bird drawing. Tickets purchased between 1/15 and 1/25 at noon will be entered into an additional drawing for a $250 VISA gift card. Did you already buy one? How about another?! After all, proceeds benefit the college scholarship program for CUSD students, as well as grants for our hardworking teachers and that’s a win for everyone. NOW TAKING PRE-ORDERS FOR 2019! Order your Harkins Cups through Patterson PTO and pay the same great price you would at Harkins! 20% of the sales get donated back to the PTO! Get $1.50 refills on drinks for all of 2019! Start bringing in your Box Tops to your classroom now and continue collecting through Fall Break. Don’t forget to Download the Box Tops App! The class in Kindergarten - 3rd AND the class in 4th - 6th, who collect the most Box Tops, will earn a Popsicle Party! CONTEST ENDS FRIDAY, OCTOBER 19TH! Progress for Patterson is our biggest fundraiser of the year - a direct donation campaign where 100% of all funds raised stays at Patterson. This year our goal is to raise $50,000 to transform the GREAT OUTDOORS! Patterson PTO utilizes a parent portal called Konstella. This portal is the main source of all PTO communication: Calendar, Events, Flyers, Announcements, Sign-ups, and more. The parent portal is also where you will find your classroom roster and be able to communicate with other parents from Patterson. Each classroom has the opportunity to use a class calendar, chat groups, share files and pictures, and create class party sign-ups. Your class's room parent will be using this as their main communication tool. We HIGLY suggest that you register for your Konstella account and add the Konstella app to your smartphone. How Can YOU Get Involved In PTO? So Much Fun with Patterson Parents, Teachers, and Staff! Your Patterson PTO is ran by volunteers; parents and teacher just like you! There are many different ways to get involved at Patterson. Some needs are at the school and others can be do from home. Every little bit helps! No matter if you have only an hour a month or you can provide 10 hours per week, your help is beneficial and appreciated! All of the PTO opportunities to get involved are available to view through your Konstella account.